Southern Africa Construction Equipment Rental Market size was valued at around USD 3 billion in 2017 and will grow at CAGR of over 3% from 2018 to 2024. Several construction companies are renting heavy machinery instead of purchasing. This method is proving to be advantageous for SMBs and large enterprises across several industrial sectors in the region, leading to the robust growth of Southern Africa construction equipment rental market. Steady growth has been witnessed in transportation, mining, and oil & gas industries which have large scale investments. With such high level of investments, several construction companies are preferring to lease or rent the heavy equipment, that will help them lower the project costs. This approach is assisting construction companies to save maintenance costs and incur lesser technical charges. In addition, reduced operation, maintenance and transportation requirements are also driving the Southern Africa construction machinery rental market revenue. Rise in urbanization is a vital factor driving the growth of the earthmoving & road building equipment to over USD 2.4 billion by 2024. Urbanization in developing economies such as Zambia, Mozambique, Namibia and Zimbabwe, is taking place at a speedy rate and aiding towards the construction industry growth which is expected to increase the demand for earth moving equipment. Every growing population coupled with the growing demand for residential construction activities will support the demand for earthmoving & road building equipment such as backhoe, excavators, loaders and compaction equipment thereby driving the Southern Africa construction equipment rental market. This equipment is majorly used in construction, agriculture, and other industries. Renting of heavy construction machinery such as bulk material handling equipment as an alternative to purchasing has proven to be advantageous for several companies and has resulted in steady growth for the Southern Africa construction equipment rental market. Steady growth has been observed in several sectors with large scale investments, which presents growth opportunities to the rental industry stakeholders. The need to replace legacy equipment for meeting the operational demands of businesses will increase rapidly. Growing accessibility for lease-based machinery is persuading end-users to use advanced material handling devices. 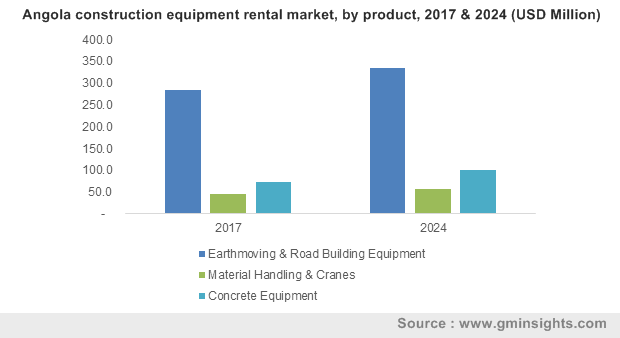 The Southern Africa construction machinery rental market is witnessing a rise in demand for material handling equipment owing to the growing need for automation of efficient flow of goods that will positively impact the construction equipment demand in the region over the coming years. The material handling equipment rental industry is poised to grow at approximately 4% between 2018 and 2024. The development of advanced construction equipment with eco-friendly features and low maintenance will provide an alternative to legacy machinery in the coming years. Procurement of new construction equipment necessitates large down payments from the construction companies. These down payments divert a large capital amount from key operating expenses and add extra expenditure such as storage cost, interest on the equipment loan amount, licensing, insurance, and tax, among others. Companies can avoid the costs related with inflation and depreciation by renting the equipment that would be factored in during replacement. 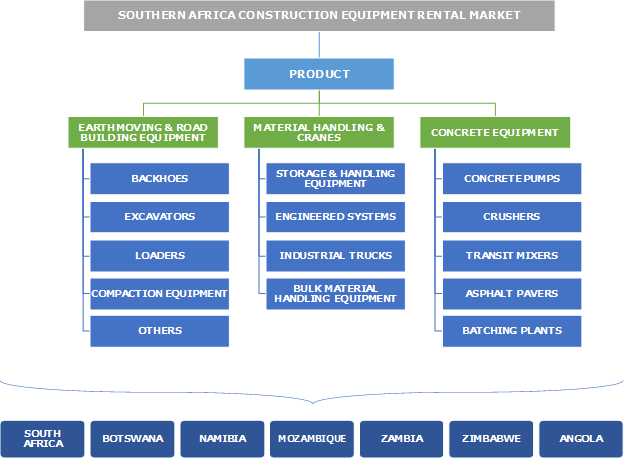 In addition, several rental companies operating in the Southern Africa construction equipment rental market are on a regular basis upgrading their equipment fleets, thereby offering construction companies access to advanced and new construction equipment and making it easier for the leasing party to act in accordance with the international and regional rules and standards. These factors are providing an impetus to the Southern Africa construction machinery rental market growth. Southern Africa construction equipment rental market growth can be impacted by several factors such as number of new infrastructure projects, exploitation of resources, level of investment, or political governance. Government bodies, development authorities and several companies have started investing in infrastructure development projects in several Southern African countries. For instance, the region has witnessed a growth in the investment from Chinese companies that has aided in the growth of construction projects in countries such as Botswana, Namibia, Mozambique, Zambia and Zimbabwe. The steady growth in the overall economy has accentuated the need for improving infrastructure. Moreover, government organizations are investing heavily in mining, agriculture and transportation. These factors have contributed immensely towards the Southern Africa construction machinery rental market growth. Rise in capital investment in infrastructure and transportation sectors is driving the Southern Africa construction machinery rental market. Government initiatives such as National Development Plan (NDP) in South Africa will drive the demand for rental equipment, at around 3.5% CAGR over the forecast timespan. Government initiatives in emerging economies such as South Africa to modernize the industrial sector is leading to rise in the demand for sophisticated machines to optimize productivity. Recent discoveries of major gas & oil deposits in Southern Africa are anticipated to dramatically improve the prospects for the region by reducing imports, and driving economic growth, thereby impacting growth of the Southern Africa construction machinery rental market. In addition, several developing economies are focusing on developing smart cities and urban development projects. Major players operating in the Southern Africa construction equipment rental market include Adima Hire, Alistair Group, Altec, Anglo V3 Crane Hire, Atlas Crane Hire, Babcock International, Barloworld, Coastal Hire, enX Equipment, and Goscor Group among others. Several vendors are focusing on developing innovative product portfolios and launching effective partnership for industries such as construction, transportation, and oil & gas. The vendors in the industry are facing intense rivalry based on quality, service and brand they provide. Companies are using advanced control technology, and telematics to attract more end-users or clients. Rise in urbanization has prompted the regional government administrations to focus on modernizing and revamping the legacy buildings which is adding the Southern Africa construction equipment rental market growth. The Southern Africa construction equipment rental market is competitive and fragmented in nature with the presence of large and small companies. It is characterized by intense competition amongst the industry participants, and regional vendors. Competition is deep as companies are competing based on the quoted rental price to attract a contract amid high price sensitivity. Leading players are adopting partnership strategies. Low switching costs from buyers is also increasing the industry competition. The manufacturers operating in the Southern Africa construction machinery rental market are increasingly focusing on implementing automation and other technologies in the equipment, coupled with the rising need for safety & productivity requirements for the cranes and other earthmoving equipment. Energy efficient products, such as electric cranes, will witness high adoption and solid gains as end users are seeking to reduce costs.